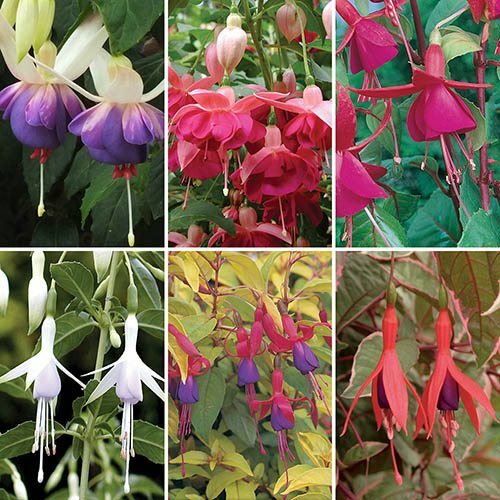 Elegant and beautiful, fuchsias are a must-have for any gardener and this wonderful collection gives you six of the best hardy shrub varieties from the wide range of colours they produce. Flowering as early as June, they'll come alive with an explosion of pink, purples, reds, whites even blue the spectacular flowers hanging daintily from their stems. Perfect for borders, pots & containers, they will provide structure and colour all summer long. These very hardy, reliable garden performers will thrive in your garden, coming back with bigger and better displays each year, and in such a range of flower colours, flower shapes and habits. Supplied as a selection of 6 different coloured named varieites as 9cm potted garden ready plants to plant straight out. (Please note that varieties may vary based on seasonal availability). Elegant and beautiful, fuchsias are a must-have for any gardener. This wonderful collection of some of the best hardy shrub varieties gives you six of the best from the wide range of colours they produce. The beautiful foliage ranges from lime to dark green, even cream tipped leaves. Flowering as early as June, they'll come alive with an explosion of pink, purples, reds, whites even blue the spectacular flowers hanging daintily from their stems. Perfect for borders, pots & containers, they will provide structure and colour all summer long. These very hardy, reliable garden performers will thrive in your garden, coming back with bigger and better displays each year, and in such a range of flower colours, flower shapes and habits. You will get our selection of 6 different coloured named varieites, as shown here, as potted garden ready plants to plant straight out. Please note that varieties may vary based on seasonal availability. Supplied as a set of 6 x 9cm potted plants, ready to plant out.